As much as we love to cook and eat at home, we also enjoy going out for dinner. It is nice to get out, relax and eat a meal without any prep or cleanup. I bring home new ideas and often just plain feel inspired. We are fortunate to live in the Twin Cities where there are so many great restaurants to choose from, and to be able to enjoy a meal out quite often. I have mentioned that I can scarcely make a cheese sandwich without whipping out my camera to take a picture. The same goes for restaurant meals. Even with this slightly obsessive hobby, I don’t want to bother other diners, so I snap photos quickly on my mobile without flash. They vary in quality, but they are sufficient to give a taste of a few dishes at restaurants around town that we’ve enjoyed in recent months. 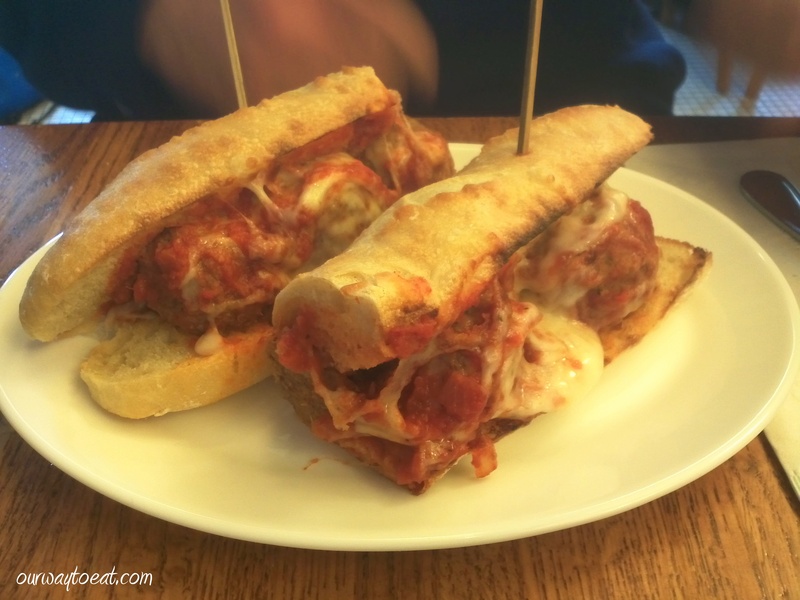 Beginning today, and for the next few posts I’m going to share our dining adventures around town. I hope you will be inspired to try out a new place. A few weeks ago, we found ourselves driving around in Minneapolis on a rainy day, becoming hungry. 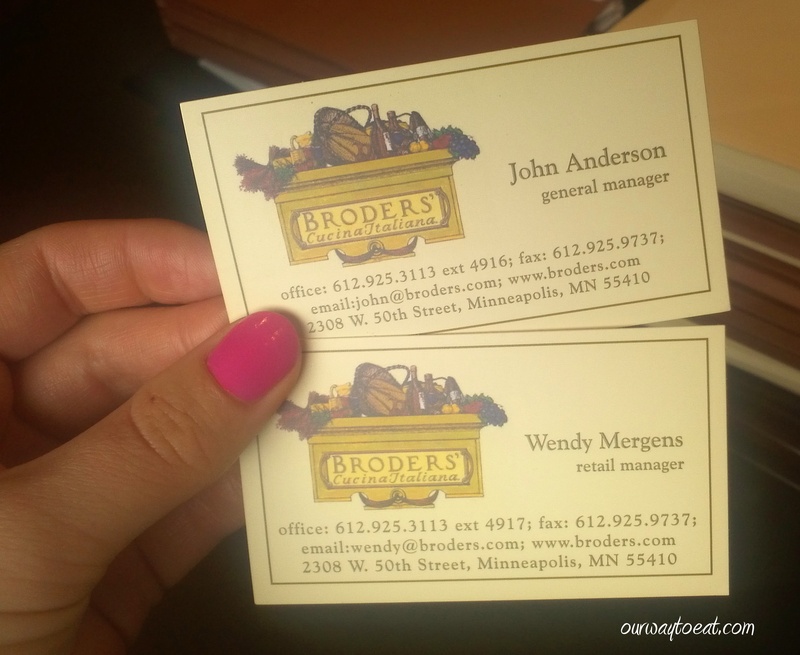 I was navigating with my mobile phone and so it should come as no surprise that we ended up at an Italian restaurant, Broder’s Cucina Italiana, a casual Italian deli-counter with dining tables. It was crowded. We stood in line and ordered and the chefs had time to prepare and hand us our plates of food before we even had a place to sit. We learned that the restaurant had been featured on Diners, Drive-ins and Dives on the Food Network a few days before, and it was rainy, and most importantly, they serve good food. The busy-ness is justified. 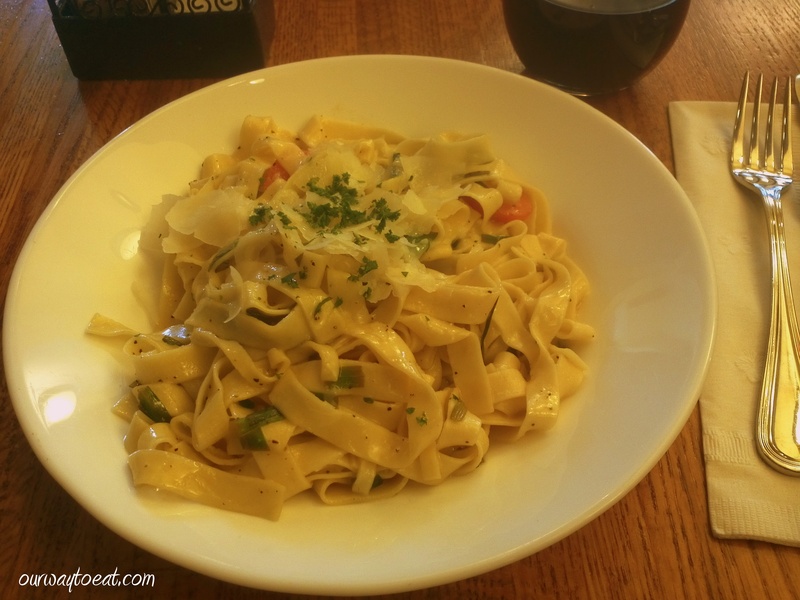 I had the pasta special of the day which was egg fettuccine with local green garlic and grape tomatoes. The fresh pasta had a nice chew to it, and the green garlic was oniony and mild. It was dressed in olive oil with a shot of lemon juice and shaved Parmesan cheese. It was at once hearty and refreshing. I loved it! Keeping with the Italian theme, a.k.a. where we dine when I’m choosing, the next meal on our Twin Cities tour are two plates of pasta we shared a Pazzaluna. For some reason even though we’ve both lived in Saint Paul for almost a decade, neither of us have eaten at this downtown Saint Paul fixture. We decided to split two pastas so we could try more than one dish. I ordered the Ravioli di Magro, a spinach and ricotta-stuffed ravioli made in-house tossed in butter and sage, and served on sugo pomodora. [sugo again! It means sauce!] 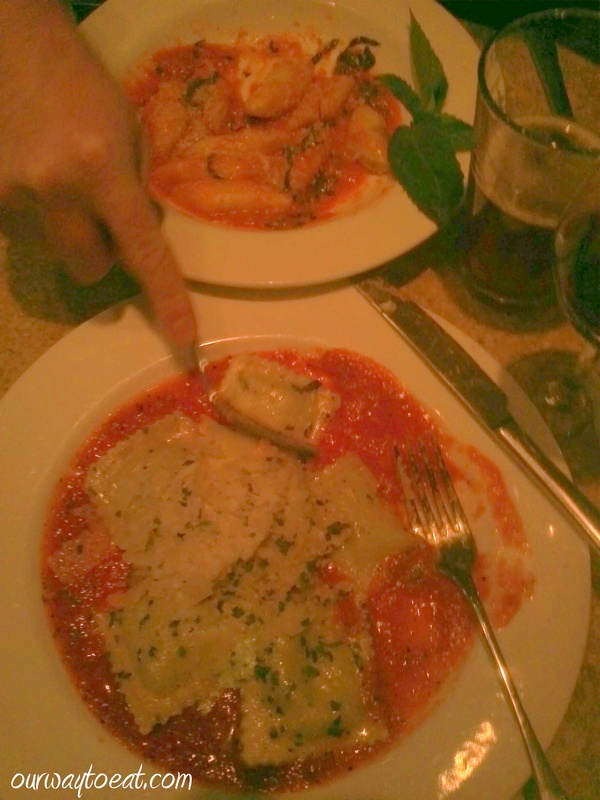 Bjorn ordered house made Gnocchi Quattro Fromaggi, at least that is what we thought he ordered. 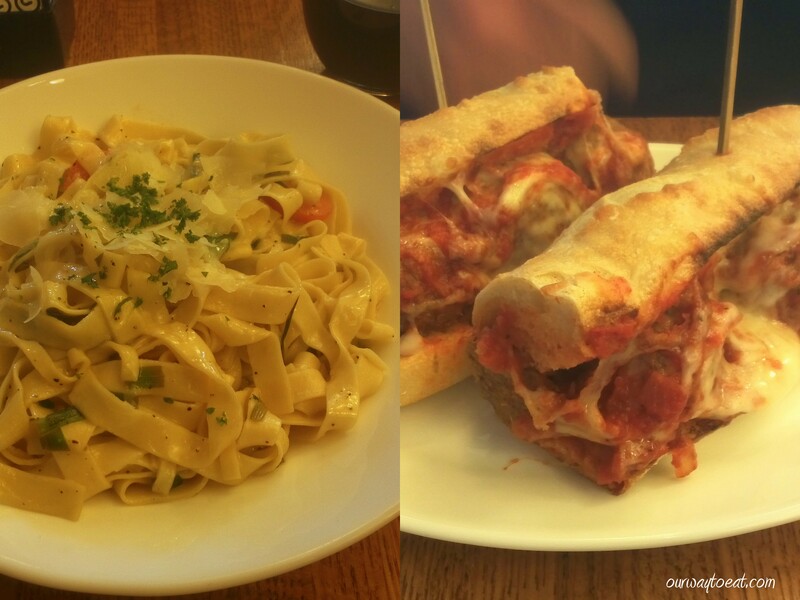 We were a little surprised when both our pastas came out with a tomato-y sauce. I don’t think there were 4 cheeses on the Gnocchi. Nonetheless, the Gnocchi was light, and nothing like the dull thud of a dough-ball some places try to pass off as Gnocchi. We liked each other’s selections better than our own. Unlike the lighter than average Gnocchi, I thought the house made ravioli was indiscernible from any other spinach ravioli I have tried, frozen or fresh. Needless to say, we by no means exhausted our options at Pazzaluna. It may not be a fail-proof menu, but we’d consider giving it another try, someday. We first heard about Ngon because it has a large selection of craft brewed Minnesota beers on tap. This restaurant was one of the places where a keg of Surly Darkness, a, limited edition Minnesota beer by Surly Brewing Company has been tapped. Having 10+ taps of exclusively Minnesota beer hints there is something special going on and that was all the convincing we needed to give Ngon a try. If we initially went for the beer, we keep going back for the food and the beer. The food is very good. Ngon uses seasonal and local produce and meat throughout its traditional Vietnamese dishes and dishes with a contemporary twist. Bjorn has been all over the menu, trying everything from Pho and other soups to the house-made pastrami sweet potato Hash and Eggs, and a selection of house-made and local Charcuterie. I haven’t gotten through much of the menu. 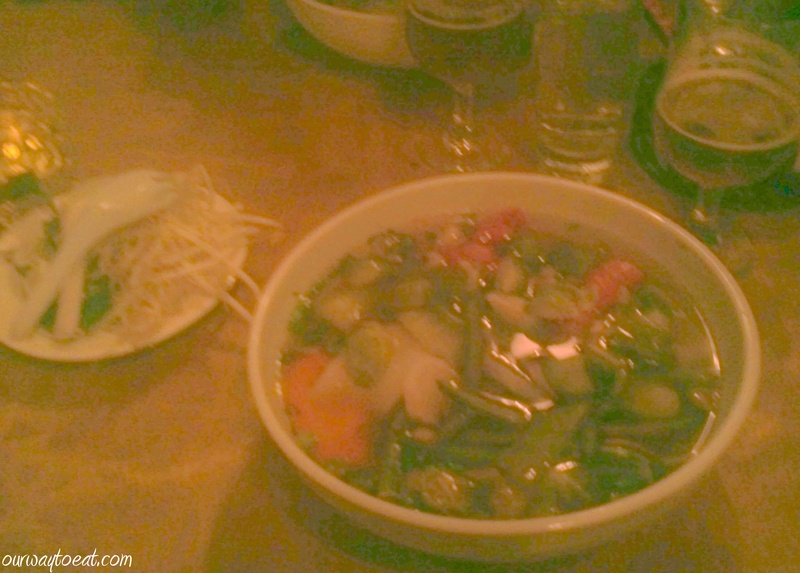 The first time I went, I ordered the Hủ Tiếu with vegetable broth and egg noodles, and I have had it every time since. I realize that Hủ Tiếu by definition should contain tapioca or rice noodles, because Hủ Tiếu is the name of the noodle, as well as the dish. I don’t care. I really like egg noodles, and they give me the option, so that is what I get. The vegetable broth is amazing. It is a culinary feat of flavor and balance that I wish I could achieve at home. It is so clear! So flavorful! So well-balanced! I am sometimes sad about how dark and dull vegetable broth can be–this broth is very light and hits all the right notes, and nearly steals the show from the generous portion of chewy and skinny egg noodle curlicues and the variety of tender-crisp seasonal vegetables in the soup. The soup invariably contains bok choy, grape tomatoes, daikon, and often brussel sprouts, green beans and whatever vegetables are in season. The soup arrives with traditional garnishes, lime wedges, bean sprouts and jalapenos, and I usually pile on all three. When I want something warming and satisfying, but still refreshing, it is this soup that I crave. Hủ Tiếu and all of the soups and Ngon come in huge bowls. Sometimes I bring home leftovers. When we’re hungry enough for an appetizer we split Vietnamese Tofu Lettuce Wraps or Crispy Vietnamese Egg Rolls which come with either pork or veg, but we’ve found that usually the soup is enough. Ngon is a bright and airy space decorated with local art that changes from time to time. They have long panel curtains from Ikea and the draft tower at the bar is a focal point. It is itself a work of art which totally suits an establishment known for their fine selection of local brews. Ngon is well-established in our restaurant repertoire, and I highly recommend giving it a try.